Canada has played 32 matches under Stephen Hart over the course of his two stints as national team head coach. During that stretch the team has scored 41 goals and allowed 36. What lessons can we draw from the following data? I'm frankly surprised at how few goals Canada has conceded during the last 15 minutes of a match, while the last 15 of the first half has been a defensive minefield. Canada's scoring has been more evenly distributed, though weighted towards the first half. 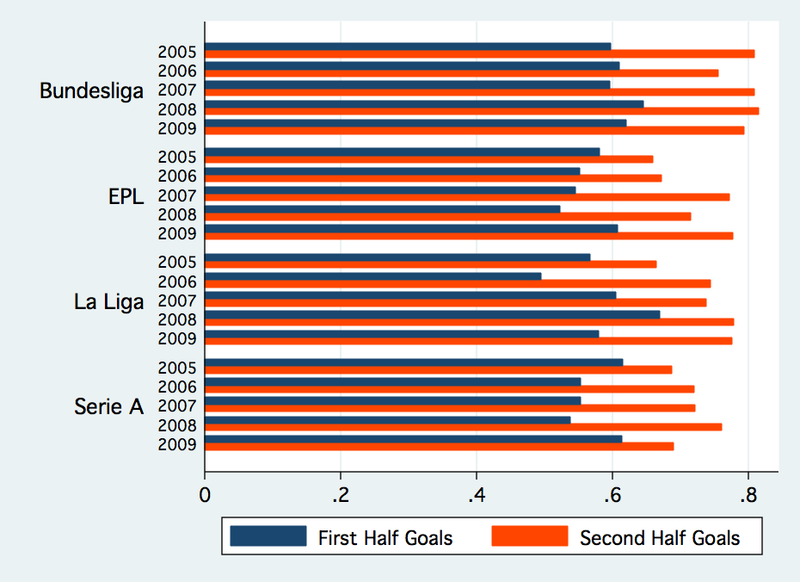 E. Bittner, A. Nussbaumer and W. Janke, Football fever: Goal distributions and non-Gaussian statistics, arXiv (Jun 1 2006).
" . . . each extra goal encourages a team even more than the previous one: a true sign of football fever." If you go to Footballscores.com you will be able to find out all the latest football scores from games being played all over the globe. Go check it out now!